This is a skating hockey drill that is geared for the young kids. The focus is on control turns and inside edges int he context of a race to add some urgency. It only uses the neutral zone so if can be useful when designing a practice that uses stations. The players line up along the boards in two teams. The first player in each team is just outside the blue line (as shown in the diagram). Four cones are used, each cone is placed in line with the dots half way between the red line and blue line. On the whistle the first player in each line skates straight down the line and around the cone using a control turn. Then they skate back towards the line and do another control turn going the other way around the other cone. After the second control turn they should be just inside the red line and they sprint to the finish line which is marked by the other two cones. You can run this drill as a individual races or a relay race. 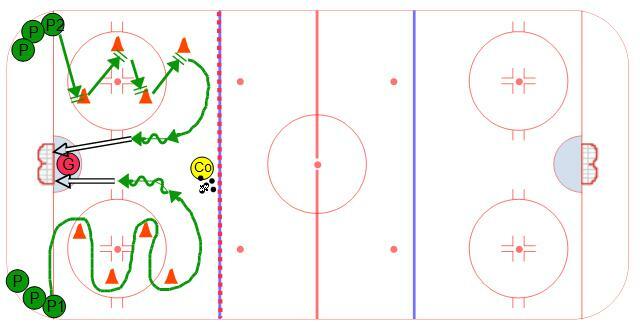 This hockey drill is meant as a station in a shared ice situation. It offers two similar drills on each side of the ice, one that works on power turns, the other works on stops and starts. 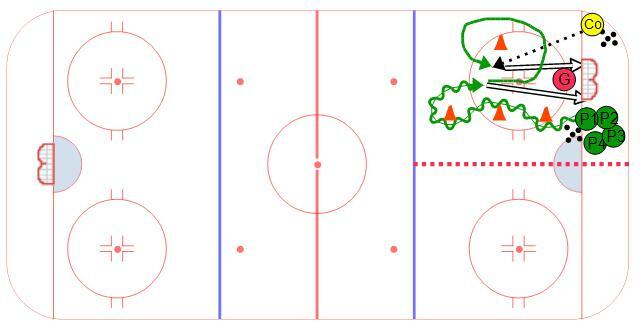 Set up the coach in the high slot in the middle of the ice with the pucks. Four cones, tires, or discs need to be set up as shown. On one side the players make turns around the cones and on the other side the players stop at each cone. 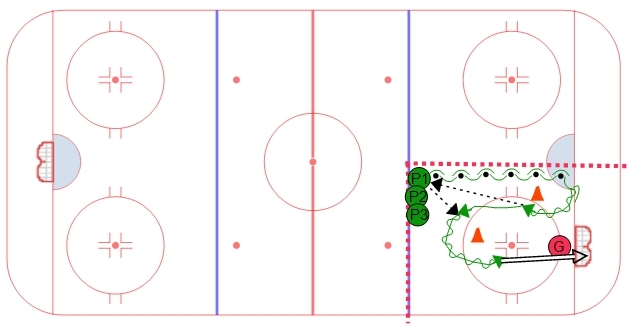 After the player navigates the fourth cone they skate into the center of the ice and receive a pass from the coach for a shot on net. 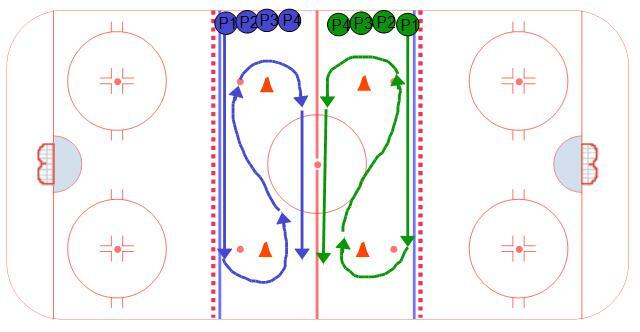 This a hockey drill for mites or teams that are using a lot of shared ice practices. The drill allows players a chance to use their inside edges while handling the puck, shooting, and receiving a pass. Place a net along the goal line in line with the dots as shown, a coach with pucks in the corner, and a line of players on the opposite side of the net. Three or four cones can be place in front of the players and one cone on the opposite side at about the hash marks. The players carry the puck through the cones so that they are protecting the puck from the cone. As they come around the last cone they turn back towards the net and take a shot as quickly as possible. After the shot the player turns to the boards, circles the around the cone and receives a pass from the coach for another shot on net.